Bestselling DC Super Heroes concept board books: ABC 123, Colors and Shapes, Opposites, and Busy Bodies come in a beautiful, sturdy carrying case. 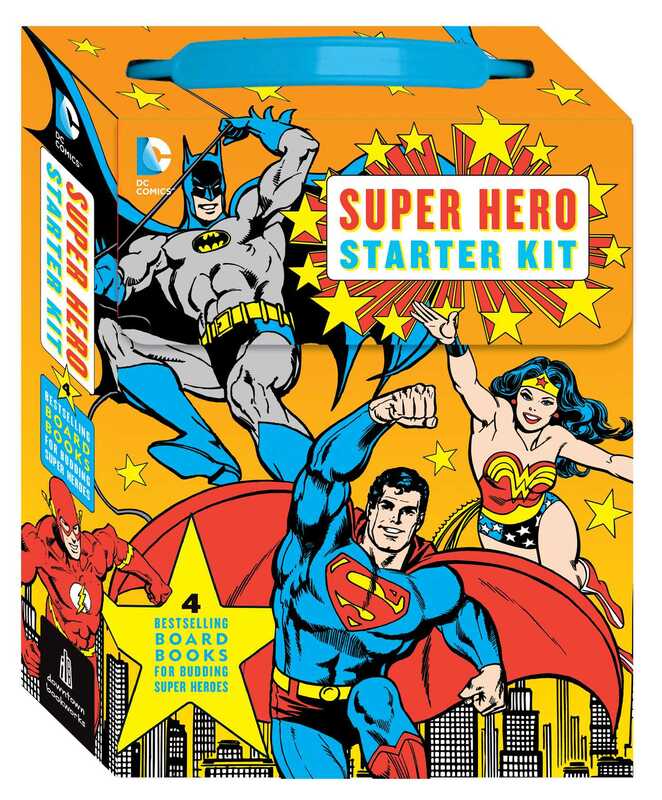 Budding super heroes will find everything they need to learn about the universe of DC super heroes--and the world around them--in this awesome collector's set. From letters (A is for Aquaman, B is for Batmobile) and numbers (10 super powers) to colorful capes, busy body parts, and hilarious opposites, every page is illustrated with classic DC comics art and designed to appeal to fans of all ages. The four sturdy, colorful, beautifully designed board books feature many of the beloved DC super heroes including Superman, Batman, Wonder Woman, Green Lantern, the Flash and others. This gift bundle is packaged in a great-looking carry case with a handle. The perfect introduction for little ones, these 4 books offer grownup fans a fun way to share their passion with the next generation.